The entire real life history of SW City is documented in this swiki. You can browse the history by year. Captain MAD Mike immigrates to Active Worlds; citizen number 295187. Old SW City (tourist SW City) is founded by SW Comit by dragging an object from the fields of Pippinville (not Pink Village, as previously believed). SW Comit immigrates to Active Worlds; citizen number 297649. SW City is founded by SW Comit, Sojiurn, SW Nitro Excell and SW Magnum. Old Town Square built by Sojiurn. Contains bot stands for Flint, Misty and Jack and a water fountain. Also contains a list of SW members' email addresses and names on mailbox objects. SW Chris immigrates to Active Worlds; citizen number 306637. Syntax immigrates to Active Worlds; citizen number 308403. Syntax Estates is founded by Syntax. Teddy's Friendly Community is founded by Teddy Man Soft. The first version of the SW City Website is launched. It features orange colours with a street sign navigation bar. The first issue of City Life is released by SW Comit. James River is founded by SW Chris. First SW City Subway Station is built in Palm Grove near the Baseball Field. "SWeeet City" Movie premiered in AWCC at 10s 32e on October 15th, 2000 and was played until November 15th, 2000. 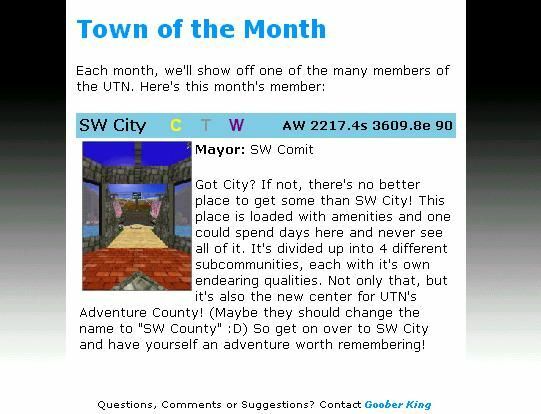 SW City is the Universal Town Network (UTN) Town of the Month. SW City turns 2 years old. SW City 2nd Birthday Bash kicks off! OniLink immigrates to Active Worlds after winning a citizenship during the 2nd Birthday Bash: citizen number 335093. SW City 2nd Birthday Bash ends. Saddle Creek founded by OniLink. It's named the first public sector (suburb) of SW City. Silver Valley founded as a public sector. Syntax wins a CY Award for www.swcity.net in the category of best AW Themed website. Old SW City Hall near SW City GZ is destroyed. New City Hall built at 2328s 3830e. Silver Valley suburb upgraded to subcommunity status. Nutinmuch becomes a manager. Cypris Creek viceroy is founded by Vornox. "Public Sector" name changed to "Suburb" in Forum poll. A proposal by Syntax to make SW City an island (build a huge body of water around it) was brought up. Construction starts on the "ocean." After over a weeks worth of work building shores and making water, the ocean is completed! The ocean completed 4 days earlier is named Irenic Ocean meaning peaceful ocean. Newspro installed on the website. Core staff members can now post news on the main page of the website easily. SW Chris releases the first SW City Newsletter. It features articles on the impending mayor resignation, third birthday bash, Embassy Row and Temps Island. SW City 3rd Birthday bash kicks off! SW City turns 3 years old! First Nimbusian built by SW Chris in Nimbus Land. SW City 3rd Birthdy bash ends. SW Comit, mayor of SW City for 3 years, resigns. SW Comit hands down mayor duties to Syntax. Saddle Creek also upgraded to subcommunity status. OniLink promoted to Manager. Vornox's viceroy lot Cypris Creek gets promoted to "Suburb" status. SW City Ground Zero revamped by Syntax. The very first SW City Ground Zero is demolished and a new Ground Zero, which contains the monorail track, wooden towers and pink/orange tiling is built. SW City Charter is approved by all four staff members and is released to the public. Cypris Creek promoted to subcommunity status! A party is thrown for Vornox on Flangton Island. Espilae immigrates to Active Worlds: citizen number 349220. Rossyboy founds a new SW City Newspaper: Poppage Press. SW City is graced with 4 CY Nominations! SW City for Community Development in Architecture/Urban Planning/Design. 3rd Birthday Bash for Community Initiative in Community Groups/Activities and Events. SW City for Community Initiative for a Community or Town! Mango Land for Creative Vision & Application Environment Design in a Public Building World. SW City's UTN Subnetwork "Republic" opens to the public! SW City Pre-Cy Party 2002 kicks off at SW City Town Square at 6pm VRT. Moves to Uncle Nitro's Bar and Grill in Central SW City. CY Ceremony starts at 7pm VRT. SW City wins two more CY Awards over the course of the night! Praxten Oil Rig built by SW Comit wins in the category of Community Development in Architecture/Urban Planning/Design. Eastern Ocean Expansion completed. Skexis River?, which stretches nearly 600 coords from the expansion to Cougar lake? has also been completed. Besburn River, which will extend over 13000 coordinates to Horizon City, is also started. Espilae's island named Esperion Isles? is promoted to suburb status and joins the Palm District, becoming the first suburb to join that district. Hundreds of coordinates of forest is built in the Vastlands?, which is the area bound by the Irenic Ocean, Visharas River, Cougar Lake? and Skexis River?. The CY statue for SW City's "Best Town/Community" Award is finally placed south of SW City Ground Zero. SW City 4th Birthday bash kicks off with two building contests. Residential contest in Cypris Creek. Industrial contest on Hyokia Island, Palm Grove. SW City turns 4 years old! SW City 4th Birthday Bash continues at 6PM VRT with Wacky Races, Games Night and the Amazing SW Race (a spinoff of the CBS TV show "The Amazing Race"). SW City 4th Birthday Bash ends. www.SWCity.net is transferred from Namezero (domain forwarding) to Godaddy, which is a domain host. SW City Staff dumps Tripod accounts and uses this as the main server to host pictures, midis and wavs. SW City debuts their very own radio show. 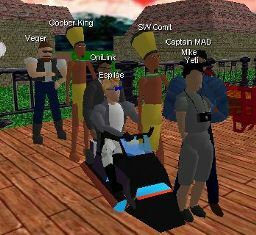 SW Chris, SW Comit, Goober King and Captain MAD Mike participate in discussing such things as AW v3.4, AWRPG and thumb drives. 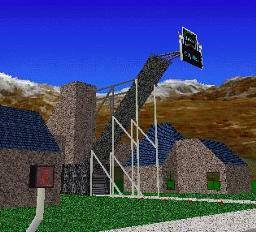 A new suburb is created by Ferruccio named Castle Pines. It is located on SW City's second bigget island, Sybit Island. First Submin built by Espilae in Shannon Cove?. SW City Radio episode two is released. Syntax, Captain MAD Mike, Goober King and Archergirl discuss such matters like the addition of tourist access and Z-axis rotation in Alphaworld, the death of the community and Pineriver's latest AW video. Landing Point Isle (LPI) is revamped by Ferruccio. Screenshots of various areas from each District are added to their respective District pages on www.swcity.net. Syntax and SW Comit double the size of Besburn River, making it over halfway on it's journey to Horizon City. SW City turns 5 years old! SW City's 5th Birthday Bash starts with a Historical Tour around old SW City by SW Comit at 10pm VRT. The Syntax Estates' Sculpture Building contest also starts at this time. SW City's 5th Birthday Bash officially kicks off with SW Comit's fireworks infront of the New City Hall located beside Mount SW and King Khalid Airport. The universe message advertises SW City's 5th Birthday Bash for a few minutes, which draws in a huge crowd. 40+ people show up at SW City Town Square for fireworks. The Alphaworld sky is turned to night and a world message is set to Alphaworld. "Immigration Officer: Welcome to Alphaworld! :) The largest building world in Cyberspace! Join SW City as they celebrate their 5th birthday. Complete details at: http://swcity.net/birthday.htm." New SW City Hall is opened to the public after a short speech by Syntax. A red ribbon is cut to symbolize the opening of the new hall. Very large attendance here. Core Staff poetry reading is skipped, and the SW City Subway Challenge starts at 11:00pm VRT. 1st: Ferruccio with 96 logs. 2nd: Captain MAD Mike with 61 logs. 3rd: Espilae with 54 logs. 4th: "Synner Jr." with 43 logs. After the Subway Hunt, people gathered at Mango Land to test out it's new game "The Lava Chamber." Afterwards, the remaining crowd gathered at Velothi Island to hang out at the coffee shop and check out the Stargate Teleporter. Events continue for SW City's 5th Birthday Bash. SW Comit's version of the Amazing Race and the second Amazing Race to take place in the city gets a good response as about 10+ people participate. Morgul Mines? Minigame in Syntax Estates debuts to the public. SW City's 5th Birthday Bash comes to a close, making it the most successful Birthday Bash, or Event for that matter, in recent SW City history. SW Comit takes an official census of SW Island, but not surrounding islands, with a Xelagot using the property dump that Andras had created for the city days earlier. 207 builders with 50 or more objects. 244 builders with 1 or more objects. SW City Radio episode 3 is released. SW Chris, Syntax, Archergirl, Goober King, and Espilae discuss the CY Awards, AW Radio, just why Grover's name build was deleted from Alphaworld GZ, and whether or not expired citizen number accounts should be put up for resale. Alphaworlds Cell Data Limit raised to "Large"
SW Chris creates "Journey's End" a video depicting various areas around SW City. This is the first video about SW City although not the first to contain images of SW City in it. SW City Radio episode 4 is released. SW Chris, Syntax, Archergirl, Goober King, Espilae, and Absolute Monarch run the gamut of topics in this free* form double sized version of SW City Radio. Castle Pines opens to public after over a year of being under construction. "NPC Cards" are created by Syntax while building the 'Rusty Axe' pub in Syntax Estates. Espilae and Archergirl virtually wed at the Archipilae Church in Central SW City. Over 50 people in attendance in total over the course of the night which included the ceremony and the reception at the Palais de Ferruccio ballroom. Talks with AW citizen Selanit start about creating an SW City based "RPG/Adventure" game with PHP. Ferruccio moves his large "Pyramid Hotel" from near the SW City International Airport to off the southern shores of Sybit Island. A meeting is held at SW City Hall that describes the reform of the SW City government to a more simple format. SW City core became the "administration" regular staff became "management." Subcommunities, suburbs and viceroys are all now grouped into one category, "precincts" in which managers own. The old "promotion" system is abolished. This new system is more relevant to the way things were running despite the rules written. Ferruccio starts work on a replica of the "Bank of China" tower on the southern part of Sybit Island. New Arklay City (AWTeen 2850s 1400e) owned by Hyper Anthony is officially admitted into the Scarabian Republic. First NPC's developed with PHP are built in SW City at East Ending. It is a simple mission between two Nougats where one gives you a package to deliver to the other. Work on the first large* scale PHP quest (Missing Person) is started by SW Comit and Syntax. The building contest for the 6th Birthday Bash is opened on Hyokia Island. The theme is Industrial. SW City turns 6 years old! First day of SW City's 6th Birthday Bash. Events included the East Ending Nougat Hunt, SW Amazing Race 3 and SW City Tour 2005. Second day of the 6th Birthday Bash. Events included Pipe Plunge, Mango Land Game Night and AWIA Infiltration Adventure Game. Winners of the Bash were announced. Matt888 placed 2nd winning $15US. Matt888 also won the building contest. SW Island sewer network is started by Syntax near Rage Lake Station (now named Sojiurn Station). SWCity.net goes down after our host-at-the-time screws up terribly. SWCity.net finally recovers from the terribly long downtime after the staff cuts their losses with the previous host (who was the absolute worst) and went back to hasweb. SW Comit builds a long line of foothills which separates the Faldon Desert from the rest of SW City island, creating the Faldon Valley. Clandestinian Village is wiped out and replaced with an actual village from the olden days. It is also now located in the Clandestinian Valley with the construction of some foothills off of the Avatar Mountain range behind Palais de Ferruccio. The SWiki, SW City's own 'Wiki' is launched which contains information on geography, wildlife, corporations and much more around SW City. The address is http://wiki.swcity.net. Flint gets a tip jar. 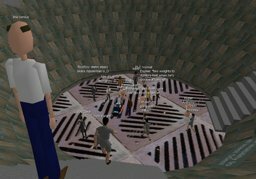 Active Worlds turns 10 years old. People gather at AWGZ and eventually move their way to SW City to view fireworks, play Pipe Plunge and participate in Mango Land attractions. Night mode was also setup for the fireworks and a cloud layer was applied to Alphaworld. SW City hosts the second 'Movie Night in SW City' and Office Space is shown. No one shows up. SW City hosts a Block Party on Cirrus Street in Syntax Estates. Over 65 people show up during the course of the night making it one of the most successful "random event" events SW City has ever hosted. Goober King from AWRadio DJ'd the event. Hyrodgen City, mayored by H2 XgF, joins the Scarabian Republic. 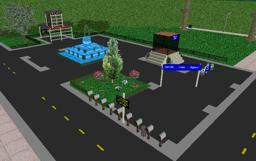 SW City Town Square undergoes major renovations for the upcoming release of SW Chris's new video. One addition to the park is a new Light Rail station near the monorail station. Many other additions, such as "info* busians" are added. Many little details are added and upgraded. "SW City: Revolution", the new SW City promotional video is released by SW Chris during the AW Reunion in Boston. Shannon Cove renamed to Eastern Shores by Espilae. Much of the Town Square is and surrounding areas are rebuilt and redesigned for the grand re* opening. SW Chris begins converting the old Central SW City monorail track style to the new, updated style. Syntax begins converting the old Syntax Estates monorail track style to the new, updated style. 'Active Worlds Discussion' board is opened on the Scarabian Republic Forums. Hydrogen City suspended from the Scarabian Republic due to inactivity. Trevison Village? on Norlisk Island hosts 'Movie Night in SW City 3' approximately seven people show up for the showing of Groundhog Day. Town Square Park Clock Tower is built south of SW Ground Zero and sparks a large-scale overhaul on many parts of Town Square Park. Ferruccio starts heavily developing the southern areas of Sybit Islands with a large-scale road project. SW City Ground Zero decorated for the Halloween season. Nougat and Nimbusian-o-lanters dot the pathways. Great Submin Brew Fest is held just south of SW Ground Zero. Talks begin with bot programmer Ima Genius about how to implement the current SW City PHP game system in with a server-side database. Syntax and Ima Genius begin re-coding the current PHP game system to work with an swcity.net database. A new PHP quest, Heretika Artifact, is launched for the SW City Halloween event. The AW skybox is changed to a night sky, world fog is added and the world light is darkened by Stacee for the event. SW Chris completes converting the old Central SW City monorail loop to the new track style. SW Chris finishes what Syntax started: converting the old Syntax Estates monorail loop track to the new style. Eastern Shores building contest, for the 7th Birthday Bash, starts. The second SW City Block Party is held in James River. SW City's 7th Birthday Bash kicks off with its first day of events. The second day of SW City's 7th Birthday Bash starts with the second batch of events. SW City Interactive v1.1 is released to public. It contains features such as member profiles, memberlist and SUT navigation bar. Faldon Village totally rebuilt and redesigned by SW Comit. Old Faldon Village moved to Terentepa Desert. 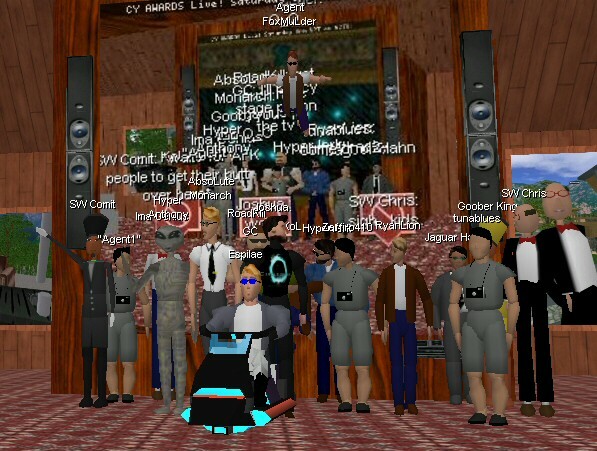 Goober Zone (AW Radio) invades Club Cyberdome in Syntax Estates. Danchan-Arknthang?, a major Subminian embassy located on the Shannon Coast, is announced by Espilae. Cy Awards Pre-Party at Uncle Nitros Bar and Grill. The Pre-Party had a good turnout, but the Cy's were postponed due to server bandwidth issues. Oops! Cy Awards ceremony in Cy Awards world! SW City comes home with three awards! Ferruccio's Wing House is announced, located at AW 2180.77S 3642.83E. Baro starts building a Shig farm on the northern shore of the Irenic Ocean. SW City Interactive reaches 300 registered users! AWI adds 324 primitive building objects, designed by Syntax and SW Comit, to the Alphaworld Object Path. AW Expo 2006 begins in Sparkles World; SW City booth recieves much acclaim and encourages new visitors to the city. SW City was added to AW's official browser teleport list. Town Square Park's visitor counter reaches 10k hits, just under a year after its induction. SW City's Builder's Academy is officially re-released! The new format contains 5x the information over the last Academy website and now sports a much more updated look. For the first time in 6 years, SW City brings in the new year with the promoting of Espilae to the SW City Administration, making him a city governor. Espilae has decided to name his new district Shores District. Espilae accepts Hyper Anthony's request for his land grant to become a precinct, becoming the Southern Highlands precinct. 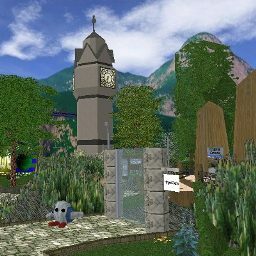 V4s_R_Us Building Contest Ends; SW'ians that participated received v4 building rights in Alphaworld. Oakdale was admitted into the Scarabian Republic. The 8th SW City Birthday Bash kicks off with the potluck building contest at Bueny Peninsula?. The formal first day of events for the Birthday Bash kicks off. 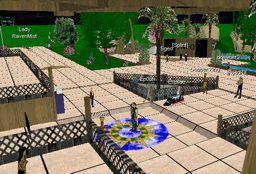 Events on the 1st included the release of SW City Interactive 3.0, a mover tour guided by Nimbusian Hot Air Balloons, and an SW City Block Party. The second day of the Birthday Bash kicks off with Amazing Race V, a guided tour of SW City Interactive, the closing ceremonies and then a Nintendo DS Virtual LAN Party! Avatar objects are added to the Alphaworld Object Path; Humans, Birdes, and Grays begin appearing around SW City. Long period of general inactivity. Bueny Peninsula? is released as a public building area. Heavy SW City Interactive development. Southern Highlands hosts the grand opening of Rising Glen Retreat with many builders taking up residence. A new SWI quest is also available. SW City Interactive reaches 600 registered users. SW City Interactive version 3.1 released. Features include phone system and voicemail messaging system. Espilae accepts Joshua's request for the Sequini Isles to become a precinct, and Joshua becomes an SW City manager. Baro opens the Zelen� Islands? and Zlata Ves, small outposts in the delta of the Emswell River?, to trade with SW City. The islands are a major exporter of canned fish and Shig wool. Most SWians become inactive throughout December as the usual winter hibernation begins. Winter arrives in SW City; Town Square Park is covered in snow and seasonal decorations are placed. SWCity.net recieves a redesign. The navigation bar has been moved the the right of the news feed while many links were cleaned up and reorganized. Moonlight Heights, a large city in AWTeen led by AlexTheMartian, joins the Scarabian Republic. SW City Interactive introduces player stats; Mini-game win/loss records, SWiki Card Stats, and Profiles are largely expanded. SWI is now also integrated with AWPortals. The SW City Times are under new management, passed from Syntax to Hyper Anthony. Sevens develops the community of Hartford Fields in the Outerlands. The Alphaworld Object Path recieves an update, including a new wall/floor set, new pictwalls, semitrans mask set, and various others. Pamozo Island is built off the coast of Syntax Estates as a hub for users with v4 privileges to activate them when needed. Bach Zhaa writes 'The SW City Chronicles' while traveling through Alphaworld. His work can be found here. Active Worlds 4.2 is released. A wave of building sweeps the city as new building commands (such as scale) are introduced and as older community members make a return. SWI also begins a resurgence in development. Areas of note include Scoperta Forest?, Norlisk Island, Zlata Ves, and West Central SW City. 200 million objects exist in Alphaworld. A SW City specific version of Twitter is released, using the Scaranet bot to leave 'sweets' for other community members to see. Switter feeds are also implemented into SWI User Profiles. Syntax begins work on Terrax Swamp, featuring the special Halloween objects added by Flagg for citizens to develop Halloween themed builds. Special Halloween themed objects removed from the registry. A number of new fluff quests written by Hyper Anthony appear around Town Square Park. SW Comit expands the Ruins of the Imperial Palace archaeology area to include the Haford Divide. An Eclipse Evolution bot on global mode appears in Alphaworld. Global Chat Channels become available; channels for #world, #swcity, and #builders. Verbal commands such as '^coords' allow ease-of-use for Alphaworld users. Tourist building has been re-enabled. Cactus Jack begins construction on the Akureyri Rail Network. No one cares about recording history. SW City Interactive achieves 1000 registered users. A general period of great activity within the SW City Community. Burst of development in Rising Glen Retreat, including new residents and new SWI quests. Several new communities founded on Bueny Peninsula by Dash567 and C u r t i s. Silverliner briefly returns to assist with building a railroad across the area. Baro actively working on Zelena, expanding the once small island community into a strong nation. Sevens and Hicks8 building the community of Greensville in the Outerlands. Major renovations around Town Square Park. AlexTheMartian announces his new development area/viceroy named Imperial Strand?. It is the first actual construction that will commence on the previously deserted Seawing Island. Ferruccio begins construction on Onest Bridge which connects Sybit Island to the newly announced Imperial Strand?. The boom of activity that SW City enjoyed during the summer fades as the school year begins anew. Mark Randall adds a HUD Icon for easy access to Scarabian User Terminals through the global Eclipse Evolution Bot. Every user that is on the #swcity chat channel can see it. SW Comit begins construction on the Pillars of Tri. The first SW Interactive quest to use web interface commands is created in Ilexus Village. Syntax begins work on the Draxenhorn and the Morax Summit. The SW City Forum gets it's first major visual overhaul in many years. 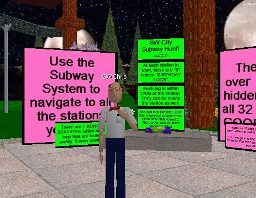 SW City Celebrates it's 20th birthday with a small gathering and tour around the city hosted by Syntax and SW Chris. The Alphaworld landing point is changed to SW City for the duration of the weekend.